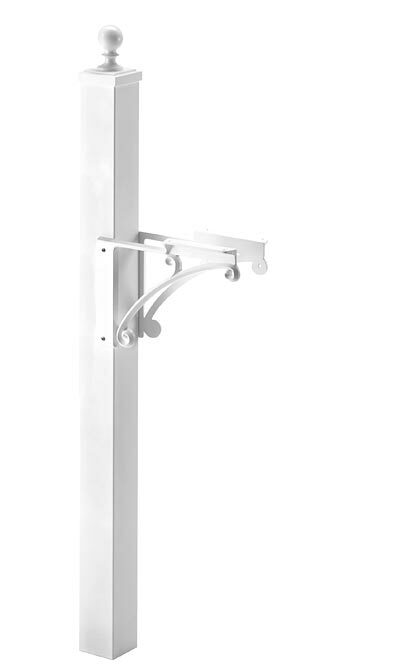 Add a stylish base to your existing Whitehall White Deluxe Mailbox with the Whitehall White Deluxe Mailbox Post and Brackets. This attractive, metal base is made to specifically hold the Whitehall White Deluxe Mailbox (not included), for an elegant look on your curb. Made from durable, recycled aluminum and coated with a weather resistant finish, this vivid white post will never rust and will certainly remain bright and lovely. The round finial adds a classic look, while the two included scrollwork brackets bring extra support to the item. Easily place your existing mailbox onto the post with the included hardware mounting kit, and slide the hollow metal post over a 4 x 4 post (not included) for stability. Enhance your curb with this White Deluxe Mailbox Post and Brackets.